A funeral service is a time to reflect on a life while looking towards the future. Roller Funeral Homes are here to help you celebrate the life of your loved one, reflect on their accomplishments and help you begin your journey through grief. A funeral service usually includes a visitation or wake, a formal funeral service and use of a hearse to transport your loved one to the burial site. Once at the cemetery, the final resting place for your loved one can be a cemetery plot, entombment in a mausoleum or one of many cremation options. 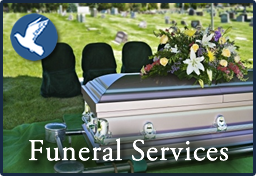 In addition to the funeral home's basic services fee, costs often include embalming and dressing the deceased; use of the funeral home for the visitation and funeral service; and use of vehicles to transport the family if they do not wish to use their own. The cost of a casket, cemetery plots or crypt and other funeral goods and services also will be factored in. At Roller Funeral Homes, we believe in the healing affects of a full funeral service. Families can create a unique and deeply personal experience that can both offer tribute to your loved one and offer greater comfort to your family during time of grief. The genuine care and comfort of our families is our highest mission. We pledge to provide the finest personal service for our families who will always be comforted by a compassionate, relaxed, yet refined setting. "The Roller Experience" fosters healing and offers solace, fulfilling even the unexpressed needs of our families. Generally, a member of the clergy or other person chosen by the family conducts a service of remembrance. We encourage the active participation of the family in helping plan this part of the service. Many times family members take part by reading a passage, singing or assisting the clergy.